Jason David Frank is 35-years-old. 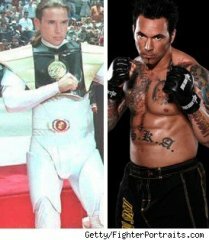 Jason David Frank is also the guy who use play Tommy the Green and then White Ranger on the kids show “Mighty Morphin Power Rangers.” As a Ranger he use to save the world everyday by battling guys in rubber monster suits. Now he’s giving up his tights to fight regular guys not from outer space and in the ring as a mixed martial arts fighter. Yes, the guy who use to control the mecha Dragonzord is now a MMA fighter, and recently he had spoken with MMAweekly about how he hopes to one day fight inside the UFC octagon. Frank, a 6th degree black belt recently signed a deal with a new management team with hopes of ultimately stepping inside the cage. All jokes aside, Frank does have an extensive martial arts background so he can be a formidable opponent and find success as a MMA fighter. Of course, the only nod against him is probably his age. At 35, it is hard to be successful especially when he’s never had real MMA training. Regardless we at YBMW wish him the best of luck and will definitely be cheering on the Green Ranger as he was always our favorite.